Native is the online journal for the Digital R&D Fund for the Arts, England’s £7 million programme established by Nesta, Arts Council England and the Arts and Humanities Research Council to support experimentation with digital technologies in the arts. Native contains feature articles exploring key #artsdigital themes and questions, information on funded projects and insights arising from those teams. Suzy Glass and Emmie McKay are both part of the learning team, led by Rohan Gunatillake. You can sign up for the Native newsletter here. You can find out more about the Digital R&D fund for the Arts here. 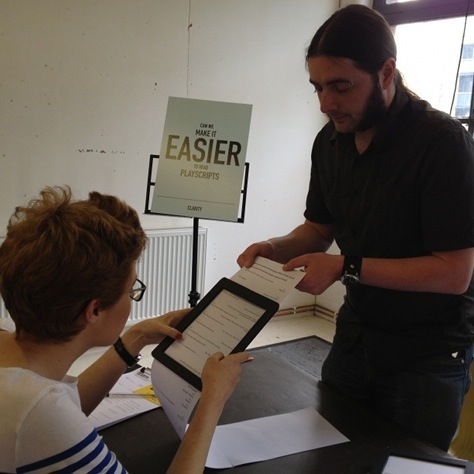 Image courtesy of Silvia Novak: testing a paper prototype at an Unlimited Theatre workshop. More here.